I found this beauty at Orchard Supply last month. I placed this beauty in the tulip bed next to my fairy rose. I love the way she has her hands placed. I'm going to put a vase of flowers in her hands for my garden tour. She has a very sweet angelic face and lovely wings. Her tender feet are an under statement. An amazing statue placed as a centerpiece in the pergola garden. The wings are grand and her robe is draped over one of her shoulders and then gently falls softly down off her other shoulder. Perfection. And I hope you have enjoyed your visit. 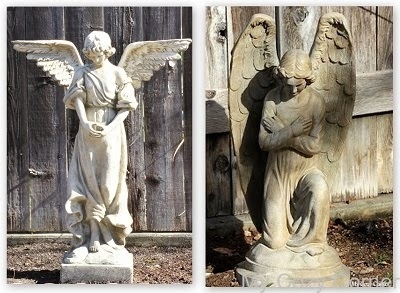 Love the angel and she looks perfect in your garden. Hope you do a post on your garden tour - I LOVE to go on them. She is lovely and a vase in her hands will be just too adorable! So Precious. I've been adding some angels to my garden, but I'm not as corageous as you so just tiny ones and so far I'm gluing them in nooks on the walls... you know for the odd glimpse "what's that I see?". So my heart positively stopped with your lovely purchase. Thank you for sharing. Inspiring and I hope it blesses your garden with further beauty and whimsy. Your new angel is lovely!! I love the idea of placing a container in her hands - please post photos, you do. Cannot wait to see it! You made a od choice in your garden decoration. She is a very sweet looking angel. Her angel eyes are amazing! Very pretty and perfect for your garden! Would love for you to share at Fridays Unfolded! Oh my, your angel is wonderful! Love all the beautiful details. LOVE IT! love them both....I think I will keep my eyes open for one! This is the pretties garden angel I've seen. I really think a vase in her hands with flowers will be lovely! Thanks for sharing at TTF! That angel is so beautiful--I would love to find one like that for my garden! Just beautiful. You couldn't pass her up. What a beautiful statue! A lovely addition to your garden! Enjoy your new week, Happy March! Great addition. They are lovely together. your angel statuary are truly amazing! !